(Hardy Pink & Yellow Gloxinia) This color form is rarely seen in Sinningia sellovii, which is a Brazilian species that tolerates heat and lures hummingbirds. Sinningia sellovii 'Pink & Yellow' is a relatively cold hardy variety with bountiful, tube-shaped blossoms somewhat similar in appearance to the flowers of Cupheas. The flowers are a deep rosy-pink, with yellow markings on the inside. The blossoms are pleasingly fuzzy whereas the dark green, veined, elliptical leaves are mostly smooth with slight pitting and fine eyelash hairs on their edges. The Sinningia genus is named for German botanist Wilhelm Sinning (1792-1874) of Bonn's Friedrich-Wilhelms University Botanic Garden. Sinning hybridized the species in the 19th century. 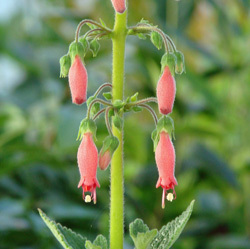 Sinningias once were considered part of the Gloxinia genus. 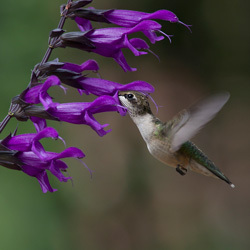 When their classification changed, people continued referring to them as Gloxinias. Hardy Pink & Yellow Gloxinia is a petite perennial with a tuberous root. It prefers rich, well-drained soil and locations with full sun to partial shade. It's a member of the Gesneriad family (Gesneriaceae), which is probably best known for African violets (Saintpaulia genus). Note: These are seedlings, and may vary in flower color from the photographs.